Mike Ullery/Call Photo Colin Roe and the Piqua running game got untracked Friday night against Lima Senior. 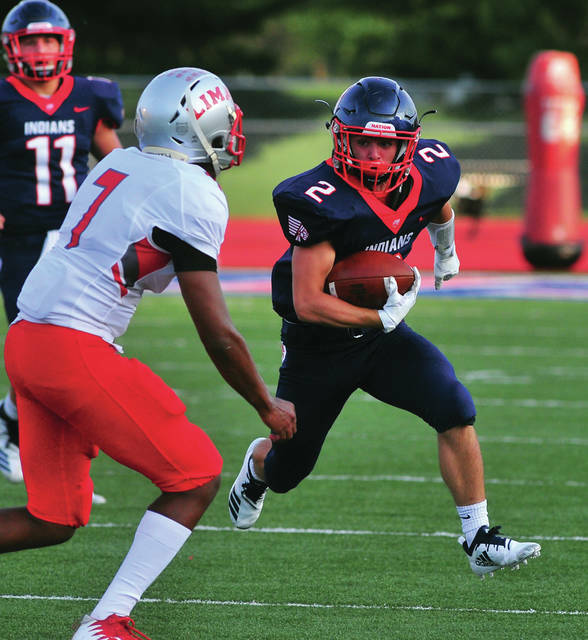 It is probably not a coincidence that as the Piqua running game got untracked Friday night against Lima Senor, the Indians success came with it. And the Indians will look to continue that when Meadowdale viits Alexander Stadium/Purk Field Friday night. After the Piqua running backs were limited to 33 yards on 15 carries in a 42-22 loss to Chaminade-Julienne to open the season, they rushed for 220 yards on 33 carries against Lima Senior in a 26-6 win. “I think what happened, especially in the second half, is we finally got into a rhythm on offense,” Piqua football coach Bill Nees said. Ca’ron Coleman led the way with 82 yards on seven carries, Makeegen Kuhn had 63 yards on eight carries and Colin Roe and Matt Blankenship combined for 67 yards on 14 carries. Pick Three: Piqua also turned the turnover game around. After being minus-one against CJ, the Indians were plus-two against Lima Senior as Mick Karn picked off two passes and Blane Ouhl had one. Dual Threat: Quarterback Mick Karn continues to be the Indians leading rusher, with 203 yards rushing on 38 carries in the first two games of the season. Steppin’ Up O D: The Piqua defense limited Lima Senior to just 235 yards and one score. Seven different players had three tackles or more. “I thought it was one of our best defensive efforts in a long time,” Nees said. Threading the Needle: On a fourth-and-15 play early in the fourth quarter, Karn threw a dime to Roe in the end zone for a 19-yard TD to give Piqua a two-score lead. Momentum Changer: Lima Senior put together a 79-yard drive to tie the game 6-6 with 1:42 remaining in the half and appeared to pick up momentum. But, Piqua answered with a four-yard TD run by Karn with 13 seconds left in the half to take a 12-6 lead the Indians never gave up. The big play was a 15-yard pass from Karn to Owen Toopes down to the 18 and a facemask penalty moved it to the nine-yard line. Puttin’ It Away: After Ouhl’s interception gave Piqua the ball at the 21-yard line midway through the fourth quarter, the Indians put together a 14-play, 79-yard drive to erase any doubts in the final outcome. Kuhn had runs of 11, 16 and 14 yards on the drive, while Coleman had a 12-yard run. Jerell Lewis campped the drive with a one-yard TD Run. Givin’ It A Boot: Karn’s punting has been impressive through two weeks. He is averaging 41.8 yards a punt on six punts. Friday Night: In other games Friday, Bradford travels to Mississinawa Valley, Covington plays at Fort Loramie, Lehman Catholic travels to Graham, Miami East plays at National Trail and Versailles hosts Coldwater. https://www.dailycall.com/wp-content/uploads/sites/30/2018/09/web1_083118mju_fb_phs_2-1.jpgMike Ullery/Call Photo Colin Roe and the Piqua running game got untracked Friday night against Lima Senior.